According to a 2014 NOAA report, the frequency of days with “nuisance flooding,” or flooding that causes road closures, overwhelmed storm drains and other public inconveniences, has increased dramatically in many U.S. coastal cities since the mid-1960s. 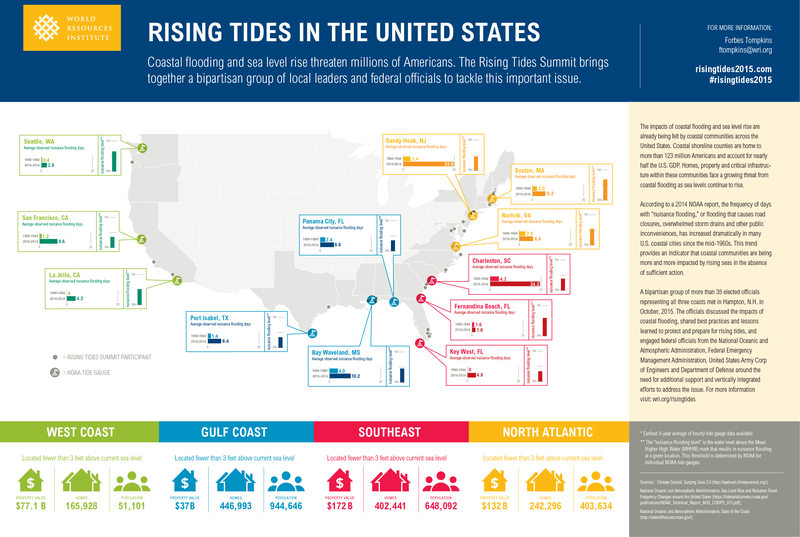 This trend provides an indicator that coastal communities are being more and more impacted by rising seas in the absence of sufficient action. A bipartisan group of more than 35 elected officials representing all three coasts will meet in Hampton, N.H. to discuss the impacts of coastal flooding, share best practices and lessons learned to protect and prepare for rising tides, and engage federal officials from the National Oceanic and Atmospheric Administration, Federal Emergency Management Administration, United States Army Corp of Engineers and Department of Defense around the need for additional support and vertically integrated efforts to address the issue.